By default, bitmap layers have a pixel density of 100%, which is just enough to display the artwork properly as long as it does not get scaled up and as long as the camera does not zoom in on it. If you intend to zoom in on a bitmap layer or to scale it up, it is important to increase its pixel density to at least the percentage at which it will be scaled up during the scene, to avoid any loss of picture quality. For example, if a bitmap layer gets scaled up to 200% in a panel, and the camera performs a 2x (6 fields) zoom on it, the layer will end up being scaled up by 400% in total. Hence, you should set the pixel density of that layer to at least 400% before you start drawing on it. Also, contrary to vector layers, bitmap layers have a limited canvas. By default, the dimensions of this canvas are set to 200% of your project's width and height, which gives you some extra space to draw beyond the edges of the camera field. You should increase your layer's canvas size if you intend to draw a very large image that extends way beyond the edges of the camera. You can increase your layer's canvas size at any time without loss of picture quality. However, if you shrink the canvas size of your layer, its artwork will be cropped to fit the new canvas. WARNING If you increase the pixel density of a bitmap layer that already contains artwork, Storyboard Pro will need to resample the artwork to preserve its proportions, which will make it lose picture quality. Hence, you should always set the proper pixel density for your bitmap artwork before you start drawing. The Change Bitmap Layer Resolution dialog box opens. In the Width and Height fields, enter the percentage for the dimensions of the bitmap canvas, relative to the camera frame. By default, these settings are set to 200%, which means the dimensions of the canvas are twice the ones of the camera frame, giving you extra space to draw beyond the edges and pan your artwork, if needed. In the Pixel Density field, set the pixel density to at least the amount of time your bitmap artwork will be zoomed in. For example, if a layer gets scaled up to 200%, and the camera performs a 2x (6 fields) zoom on it, the layer will end up being scaled up by 400% in total. Hence, you should set the pixel density of that layer to at least 400% before you start drawing on it. 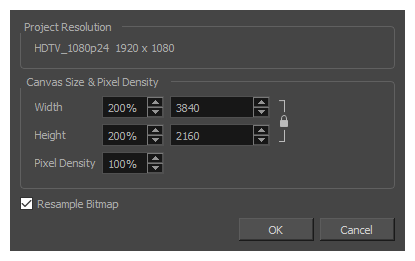 If your layer already contains artwork, and you want it to be resampled to fit the new Pixel Density setting, check the Resample Bitmap option. NOTE If you leave this option unchecked, your artwork will be scaled up if you decrease the pixel density, or scaled down if you increase it.